Humanity has long dreamed of putting boots on Mars, but those boots have the potential to stomp all over any lifeforms that may exist on the Red Planet. A seething, swarming mass of 100 trillion microbes will accompany every astronaut who lands on Mars. This diverse "microbiome" has evolved with humans for eons and provides a number of services, from helping people digest their food to keeping pathogenic bacteria at bay. While these microbes are intimately tied to humans, many of them will jump ship if transported to the Martian surface — with unknown consequences for a planet that may or may not host life of its own. "If you have human astronauts there," Phillips added, "there's no way to sterilize them. They're spewing out thousands of microbes every second. So it's a real problem." Space agencies around the world are already thinking about ways to minimize the contamination risks posed by manned Mars missions, even though the first footsteps on the Red Planet are perhaps decades away. In fact, they already have a set of guidelines to follow — a rough protocol drawn up in 2008 by the Committee on Space Research (COSPAR), which is part of the International Council for Science. The top priority of the COSPAR policy is to protect Earth from any possible "back contamination" from Mars, but it aims to help protect the Red Planet from Earth life as well. The COSPAR guidelines — which NASA and the European Space Agency, among others, are committed to follow — advise steering clear of gullies, possible geothermal sites and other "special regions" on the Red Planet where Earth life might be able to survive and proliferate. "It is understood that when humans go to Mars, there will be a release of microbes from the human habitats and from the humans themselves, and also that humans will inevitably be exposed to Mars materials," said Cassie Conley, NASA's planetary protection officer. "So the humans are only able to go to places where we expect that the Mars environment will be quite lethal to any Earth organisms that get released," Conley told SPACE.com, adding that various locations near the Martian equator might qualify. COSPAR's guidelines dictate just how clean robotic explorers of Mars and other alien worlds need to be. For example, NASA's Curiosity rover — which landed on Mars Aug. 5 to determine whether the planet has ever been capable of supporting microbial life — was allowed to carry a total of no more than 300,000 bacterial spores on any surface that could allow transfer to the Martian environment. Such numerical targets don't exist yet for manned missions, but they probably will someday, Conley said. "I'm sure that we will have more numerical information in the future, but partly we need to base that on our understanding of what kinds of hardware might be going," Conley said. "We also need to have a better understanding of the Mars environment itself." Curiosity's two-year mission should be a big help in this latter regard, Conley added. The rover is studying its Gale Crater landing site with 10 science instruments, including gear designed to detect underground water ice and another tool that measures high-energy radiation at the planet's surface. A Mars sample-return mission also would be a highly desirable precursor, Conley said. And this is indeed a key priority for NASA, which is evaluating several different strategies for getting pristine pieces of Mars into scientists' hands on Earth. The space agency may reveal its chosen sample-return path in February, after the White House releases its federal budget request for fiscal year 2014, officials have said. NASA is thinking very seriously about how to send humans to Mars safely and responsibly, having been charged by President Barack Obama in 2010 to get astronauts to the vicinity of the Red Planet by the mid-2030s. But government space agencies aren't the only entities planning out manned Mars missions. Elon Musk, founder and CEO of the private spaceflight firm SpaceX, has said he hopes to fly astronauts to the Red Planet within 10 or 15 years. 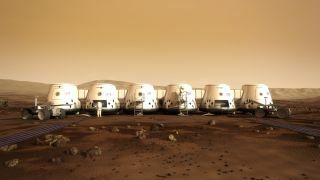 And the Dutch company Mars One aims to land four people on Mars in 2023, as the first step toward establishing a permanent colony. Mars One plans to pay for its ambitious activities by staging a reality-show media event around them — a sort of interplanetary "Big Brother." Conley said such private efforts are likely to follow the COSPAR guidelines, too. Under the 1967 Outer Space Treaty, countries are responsible for the space activities of companies registered within their borders, so the U.S. and Dutch governments have a strong interest in making sure SpaceX and Mars One play by the rules. After all, neither nation would want to be taken to international court on charges of contaminating another planet. And the companies may want to do the right thing anyway. For example, SpaceX has already initiated planetary protection discussions with NASA regarding its manned Mars ambitions, Conley said. "It's the environmentally responsible thing to do," Conley said. "If you want to be a good citizen of the solar system, you do the planetary protection requirements, just like you pick up the litter and you don't spread your pollution all over the countryside."